» A Western Movie Review by Dan Stumpf: BORDER DEVILS (1932). 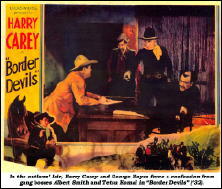 A Western Movie Review by Dan Stumpf: BORDER DEVILS (1932). BORDER DEVILS. Supreme Pictures / Weiss Brothers Artclass Pictures, 1932. Harry Carey Sr., Kathleen Collins, George (later “Gabby”) Hayes, Olive Carey and Tetsu Komai. Script and continuity by Harry P. Crist, based on a story by Murray Leinster. Directed by by William Nigh. 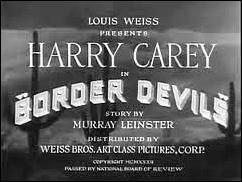 One of the first things you notice about Border Devils is that it’s based on a story by Murray Leinster, who gets a credit just under the title. And it would be interesting to know which one, because as the film unfolds we see some of the signature trademarks of Leinster‘s style all over it. The story starts with Harry Carey Sr. and his partner (don’t worry about who played him; he’s only in one scene anyway) following up a lead on a mysterious oriental criminal mastermind of the west, known only as The General. They’re drugged, the partner murdered (see?) and Carey framed for it. In due course, Carey becomes first a fugitive, then an investigator under a couple of assumed names, and finally he uncovers a plot to steal the heroine’s ranch. (How do they keep coming up with these new ideas?) He also picks up a more durable partner in the person of (who’da thunkit?) George “Gabby” Hayes. Harry and Gabby spend the rest of the film running down The General, riding up the plains, and just generally playing cowboy as they try to sort out just who’s working for the Yellow Peril and who ain’t. In the course of things, the story keeps wavering between some grandiose plot of the General (seen only in shadows at first by his frightened minions) and the more mundane matter of the heroine’s ranch, until our doughty heroes manage to penetrate the sinister cabal and unmask the baddies once and for finally. It’s easy to see the elements of Leinster’s style here: the massive conspiracy that figures in his sci-fi, the shifting identity of the hero, and the generally peripatetic nature of the tale as our cowboy commandos shuttle hither and yon like horsing lot attendants. Unfortunately, it’s all a rather shoddy affair, one of a series of less-than-inspired films by producer Louis Weiss — who would later be responsible for The White Gorilla. His westerns with Harry Carey, done at a time when the once-great Western star obviously needed cash, are uniformly slow-paced, cheap and cheerless affairs, and this one is right at the bottom of the barrel. Word has it that Carey actually had to sue Weiss for his salary, but it doesn’t show in his performance; the aging western star is as leathery-tough as ever, and a pleasure to watch, even in this seamy milieu. So like I say, it’s just a shame to see him in this dreadful mess. Director William Nigh seems to have been not so much directing as sleep-walking, and as for the “script and continuity” — well, they’re perfunctory and non-existent, respectively. Characters come on the screen without introduction, say a few words in reference to some aspect of the plot, then get interrupted by some other characters who enter the scene for no apparent reason and everyone talks until the scene shifts to something else that seems to have little if any relation to whatever preceded it. I remember thinking as I watched that whoever took credit for “script and continuity” ought to be ashamed of himself, and sure enough, he was: it turns out that the credited “Harry P. Crist” was actually a pseudonym for a sometimes-director named Harry Fraser. If you’re not familiar with Fraser, let me just say that he worked in films from the Silent days to the late 1950s without ever once showing the fainted glimmer of interest in whatever he turned his hand to. Those who celebrate the late Ed Wood should bow their heads and positively worship Fraser, who, come to think of it actually worked on the Wood-scripted Bride and the Beast. Which should give you some indication of his talent. For the record, his last official credit as a feature film director was Chained for Life, a film so tasteless I must get around to reviewing it someday. But getting back to Border Devils, I guess I should marvel at the talent of Leinster’s vision and Harry Carey’s charismatic presence. If they don’t exactly triumph over their surroundings, at least they shine through enough to be discernible. It took a little searching, but not too much, to find the source material for this film. the movie was based on a novel by Leinster entitled Dead Man’s Shoes. I haven’t been able to learn if the novel was ever published in book form, but perhaps it was, under another title. It was published as a four-part serial in the pulp magazine West between March 4 and April 15, 1931. Harry Carey is one of my favorite western actors and I’m always on the lookout for his films. He’s different from the usual young, fresh faced cowboys and presents a more mature and worn character. As Dan indicates above he was one of those actors who could make a mediocre film worth watching. I have the issues of WEST containing the Leinster serial but I’ll never get around to reading it because his western fiction never impressed me. I happen to have met both Adrian Weiss and Al Adamson, and they were charming people who believed in what they were doing. That was the surprise. Not any more cynical, perhaps even less, than people doing far more successful work. Oh, Adrian and Louis Weiss were brothers who managed to remain in the business a long time. Decades. Al Adamson was the son of Victor Adamson aka Denver Dickson, and also produced and directed highly exploitable films with capable casts that did not play many theatre dates. Denver Dickson also worked under the name, Art Mix, although he was not the only person doing so, and Art Mix is credited in Border Devils. Your research rally impressed me! The the Louis-Weiss-Al-Adamson-Denver-Dickson-Art-Mix relationship is worthy of a Keeler novel. Very impressive research by Barry, though maybe a Keeler novel adapted by Ed Wood would be closer to the mark, Dan. Carey had remarkable range within that quiet simple man approach. Probably his finest screen performance is in the film of W.R. Burnett’s Saint Johnson, a remarkably good western with a John Huston script and staring Walter Huston as the Wyatt Earp figure of the title, Carey as the Doc Holiday, and Andy Devine in a fine performance as Johnny the Deuce. Luckily he did some good B westerns again after both helming the first of the Three Meskeeter series based on William Colt Macdonald’s books with Bob Steele and Hoot Gibson. A shame this one isn’t better considering Carey and Leinster’s contributions. Leinster did at least one yellow peril novel (you can read an extensive discussion in one of Bill Pronzini’s Gun in Cheek books) so that theme is not unusual either. I wonder how many westerns he did in all? I know as Will Jenkins he did at least the novelization of the film Dallas (or was it based on one of his?). I’m glad you mentioned Will Jenkins, David. 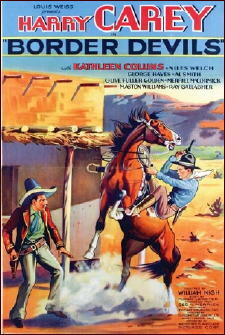 It pressed me into action again, and I learned that the hardcover version of the pulp magazine serial was published as Mexican Trail, under the Jenkins byline (King, 1933). I don’t believe I’ve read any of Leinster’s westerns. This might be a fun one to start with. Thanks, Steve, I just ordered a copy! where was border devils filmed? IMDb says Palm Springs and Kernville, California.